The climate favoured outdoor sports, an abundance of land and a high proportion of men in the population, increasing prosperity and leisure time all favoured to formation of sports fields. Cricket was on eof these popular sports and had been transported from England along with many other cultural values adopted in the colony. In the 1870s cricket gained in popularity, peeking in 1876 when a combined Vvctorian and New South Wales XI met and defeated the touring all- England XI. (Kingston p193). In 1858 Melbourne had three football teams, Melbourne, Richmond and South Yarra. Within a decade, Emerald Hill (later South Melbourne) and St Kilda had formed clubs (Daley, p289). It was not until the advent of the Saturday half holiday and shorter working hours which was instituted in the 1870s that football, and to a lesser degree cricket really took off as a spectator sports. In 1897 eight major clubs withdrew from the Association to form the Victorian Football League. According to conservation architect David Bick, The Grandstand’s extensive use of turned timber decoration is an early use of all timber decoration of the later Edwardian period. This Grandstand is the only 19th century example, which has all timber decoration. The Grandstand is based on the previous South Melbourne Grandstand which burnt down in 1926. 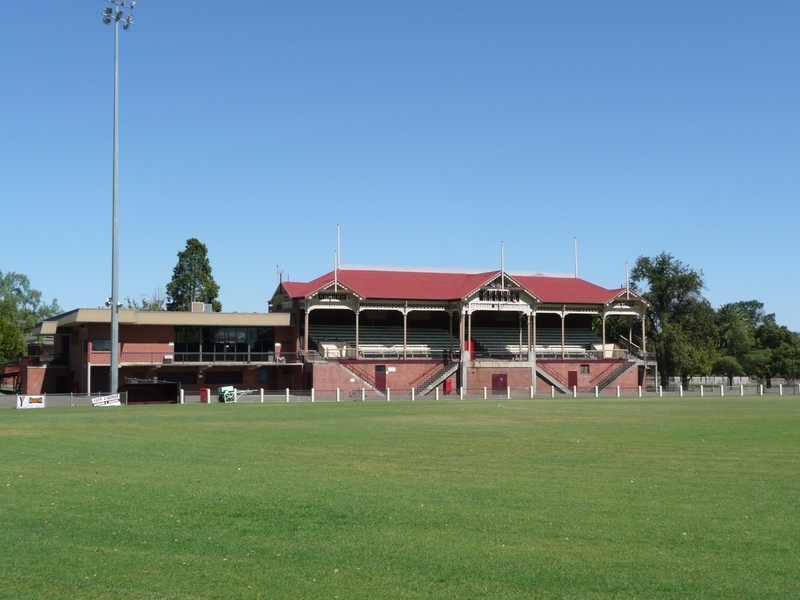 The Melville Oval Grandstand was opened in 1909 by the Hon. J Murray, Premier of Victoria. Frank Hammond the Town Clerk and Engineer was probably responsible for the design. By 1902 there were move s to beautify the former market reserve and use the area for recreation. 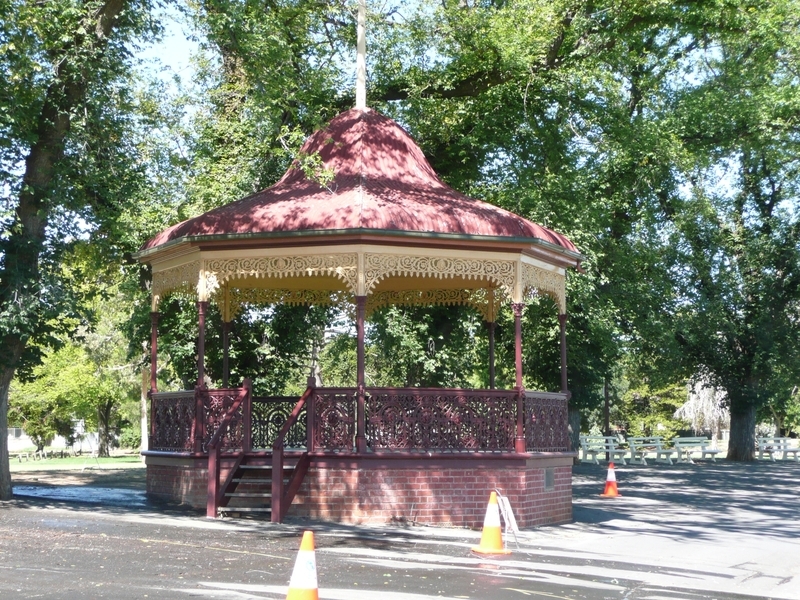 The Band Rotunda that stood beside the grandstand was relocated to the Botanic Gardens in 1988 and opened by the Mayor on 5 March 1989. The band rotunda was built in 1904. The builders were King Brothers, local builders and the cast iron columns came from Cochrane and Scott, Melbourne. 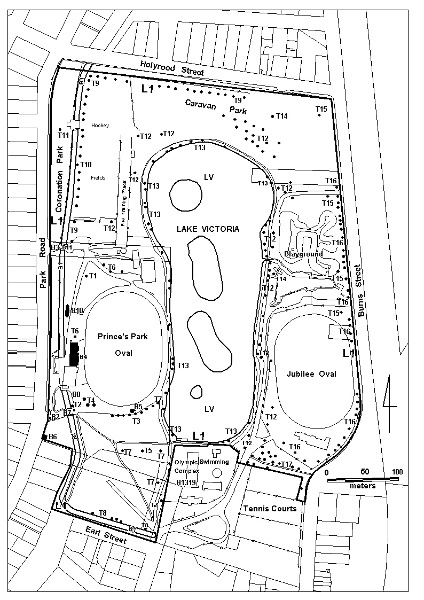 1859 The former Police Paddocks was reserved ‘for Botanic Gardens for the recreation for the recreation of the subjects and people and for no other purpose whatsoever. In 1873 the 24 acre reserve was permanently reserved as a botanic gardens. In 1881 the Council approved the forming of an oval on land that had been used for vegetable growing. In 1887 the cricket and football clubs applied to use the oval. In 1859 land was set aside for public recreation, cricketing and other purposes of public recreation. The cricket ground and recreation reserve was temporarily reserved on 6 October 1873 as a site for Recreation purposes Rs 116. In 1882 improvements commenced and in 1886 Council agreed to employ a landscape gardener to layout the grounds. Alfried Sangwell landscape gardener from Melbourne was appointed. He resigned on 27 August 1887. The 186-7 plan shows an oval is a circle 135m (147 yards) in diameter. The diameter in in 1886 wasreparted to be 154 yards or 7 chains in diameter. In 1890 a picket fence was erected around the oval and in 1896 council erected a grandstand, which was demolished in 1963 and replaced by the existing grandstand. An application for a bowling green was made in 1897, and had been formed by 1905. Tennis courts had also been erected by 1907. In 1911 Cr W B Smith, Shire President, officially opened a rotunda designed by Mr Samuel Jeffery, Shire Engineer and Charles Summers on the 14 March. The entrance gates are believed to be of the same period. A war memorial was erected in 1922. The Botanic Gardens reserve was established in 1851, and along with the Geelong Botanic Gardens, also 1851 are the second oldest in Victoria and follow the Melbourne Botanic Gardens, established in 1846. The Portland Botanic Gardens reserve appears in a map of Portland prepared in 1853. In 1857 a prize was offered for the best set of plans and was won by Alexander Elliott’s, from the Melbourne Botanic Gardens. In the same year tenders were called to layout the gardens. The bluestone residence was erected in 1858, and in 1859 the garden was open every day to the public. Not all of the land, 50 acres 3 roods was used solely for botanical purposes. In 1880 croquet lawns were laid out and are still in use. Tennis courts were also established by this date. In about 1907 the newly formed Portland Pastoral and Agricultural Society stated to develop land west of the botanic gardens into showgrounds. In 1920 the right of private tennis clubs to occupy courts in the botanic gardens was queried and the courts were eventually removed. The Agricultural Society invited the Lawn Tennis Club to share Henty Park in the early 1900s. The Colts Cricket Club is also believed to have shared Henty Park at about this time. 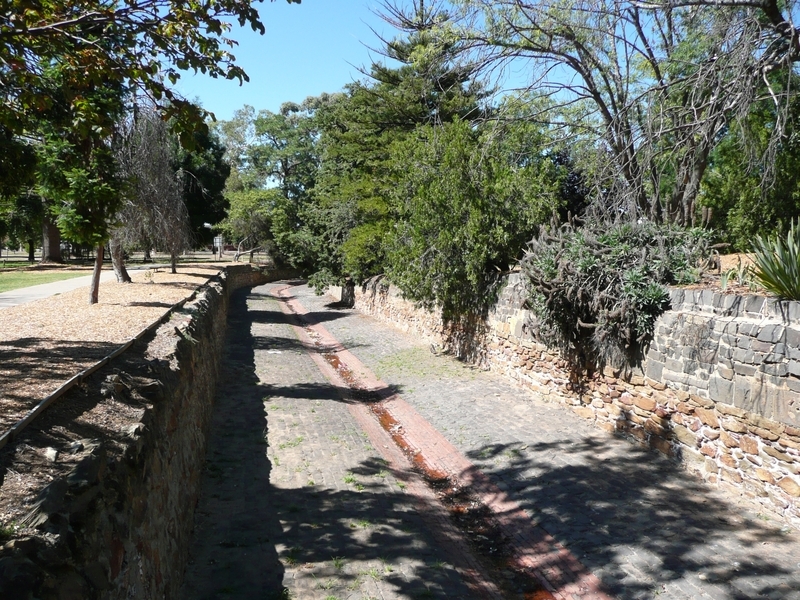 In about 1958-60 Saltwater Creek was realigned and Henty Park and the Botanic Gardens was reduced in size from 50 acres 3 roods to 32 acres 2 roods. I 1965the reservation was changed from Botanic Gardens to Botanic Gardens and park and recreation reserve (permanent). In about 1975 a swimming pool was established in the Park and extended in 1990s. Few 19th and early 20th century rotundas and band rotundas remain in Victoria. Rotundas have been lost from the Melbourne botanic Gardens, 1858, Alexandra Gardens Kew 1863, replaced 1910, and a remarkable elevated bandstand at the Camperdown Botanic Gardens 1878. The oldest surviving in Victoria are the rendered classical buildings in the Fitzroy Gardens, the Band Pavilion 1864, and the Rotunda 1873. The oldest rotunda is in the Town hall Gardens Beechworth, 1876. Other early band rotundas occur at Elder Park Adelaide 1881, Rushworth, 1888 and later altered, Walhalla 1896, Launceston 1896, Buninyong Botanic Garden s1901, [Temple of the Winds 1901, Royal Botanic Gardens, different style], Hamilton Botanic Gardens 1904 (formerly at Melville Oval, built for the Hamilton Band). The architect for the Prince’s Park, Maryborough Grandstand was the long established architectural firm, Thomas Watts, and Thomas Watts and Sons. Based on the information, Prince’s Park, has a number of elements that are of State Significance. 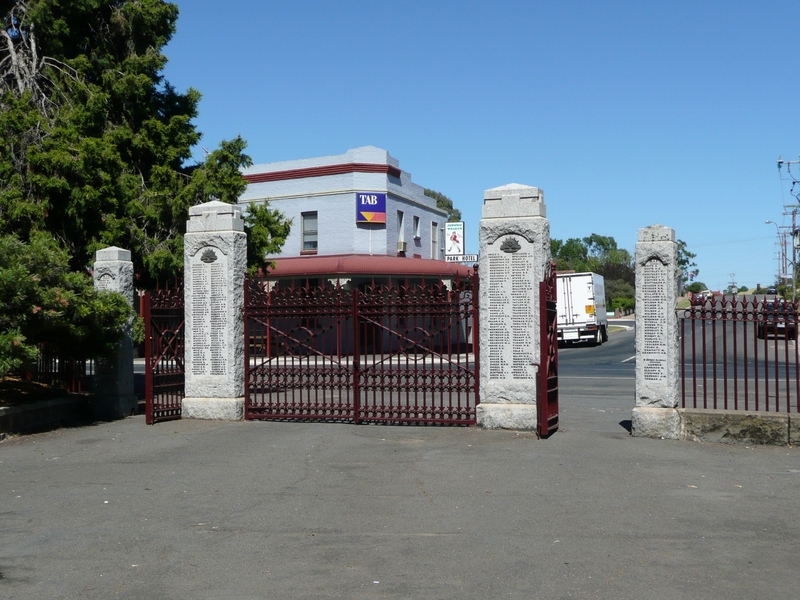 An important architectural firm, Thomas Watts and Sons designed the grandstand, and is third oldest on its original site in Victoria. The use of turned timber in 1895 is an early use of this form of decoration, which was more common in late Victorian, and the Edwardian period of the early 20th century. The recreation reserve is one of the oldest in Victoria and has remained an important sport and community reserve since 1857. 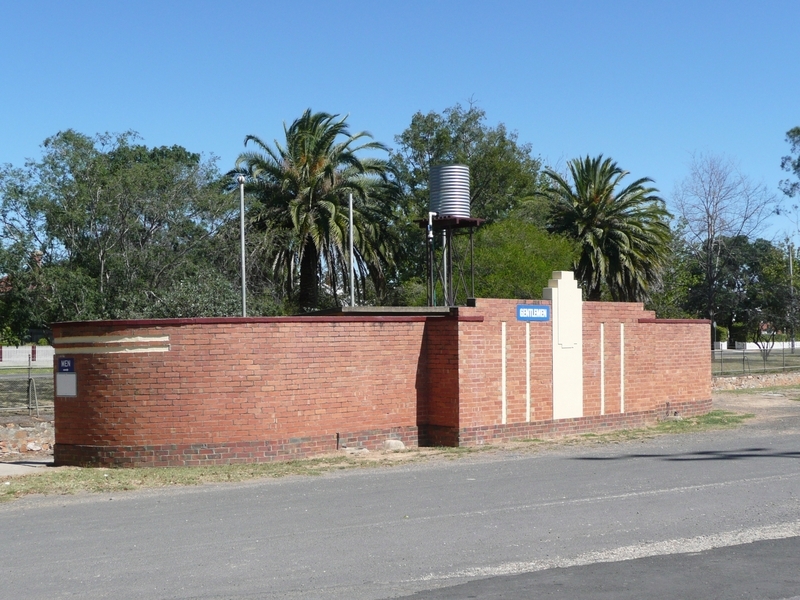 The ticket box is the only known building of its type and the rotunda, fence, gates later incorporating a war memorial, bridge and drain are uncommon and contributory structures to the cultural heritage of Prince’s Park. The Juniperus phoenicea is the only known specimen in Victoria. The adjacent Swimming Pool is of State significance and is listed on the Victorian Heritage Register. The native Catfish population cannot be assessed under the Heritage Act, but the assessment by NRE that Lake Victoria holds a population of the threatened Freshwater Catfish is obviously highly significant. 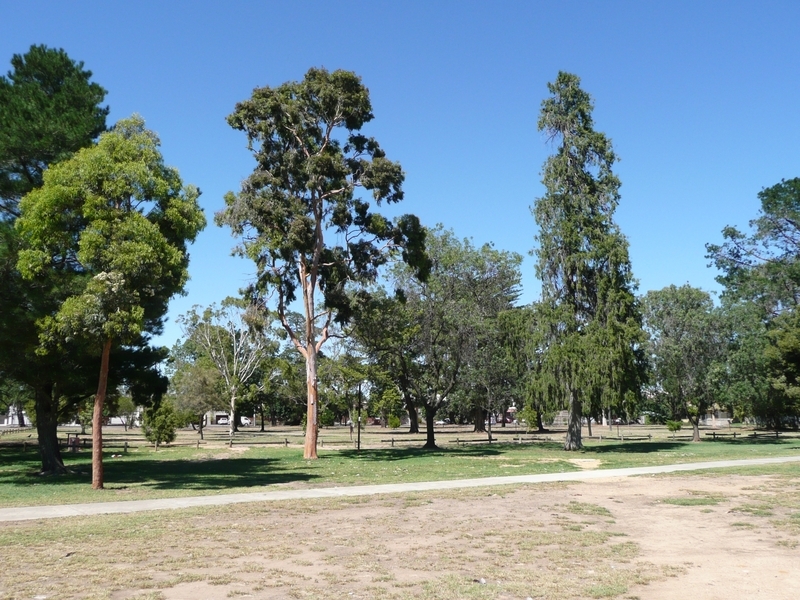 The involvement at Prince’s Park of Hodgkinson, Guilfoyle and Linaker, although minor, is the only known occurrence of these three notable landscape designers in Victoria. Their involvement probably says more about the “grand scheme” the Council had for the place and the desire to obtain the best landscape advice in the State. The best comparative place is Benalla Gardens designed in 1886 with an oval and ornamental gardens, tennis courts and bowling green. Grandstand 1963 and rotunda 1911, war memorial 1922. 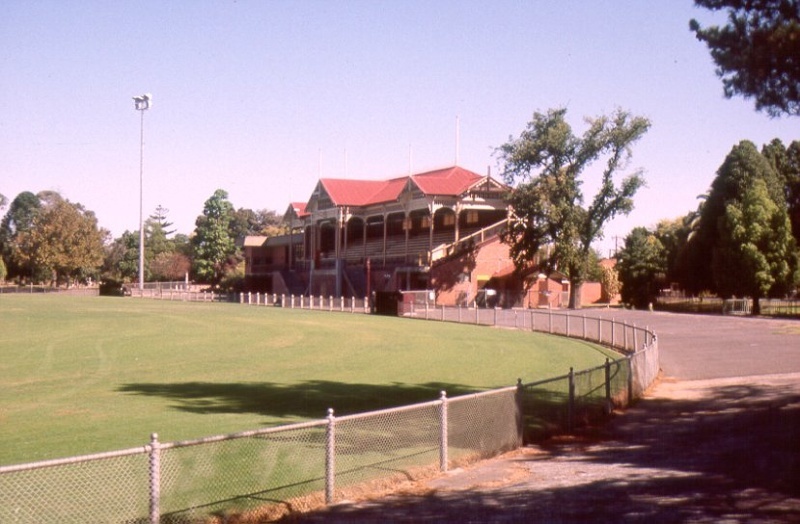 Also Meville Oval Hamilton, 1904-9 grandstand but the 1904 rotunda relocated to Botanic Gardens, and war memorial. All these have a formal avenue landscape treatment, unlike Maryborough. Some Botanic Gardens later included sports fields, but recreation was not the original purpose. 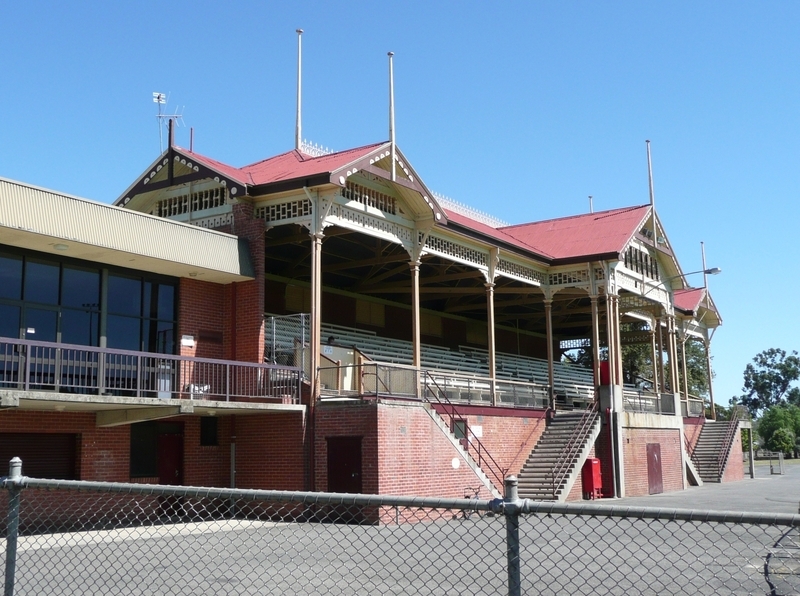 The 1895 Grandstand is the oldest in Victoria and one of only a few nineteenth century grandstands. The planting contains Victoria's only known Juniperus phoenicea, and a rare Cupressus torulosa var. corneyana, three young Toona ciliata and a fine stand of 17 Eucalyptus sideroxylon 'Rosea'. The 1895 Grandstand is an important design of the architectural firm, Thomas Watts and Sons, who designed a number of important Victorian buildings. The Prince's Park Grandstand is their only known example of this type of building. The Grandstand uses extensive turned wood decoration and is an early example of all timber decoration that became more widespread in the late Victorian and Edwardian period. The Park includes a collection of 1881 - 1909 buildings and structures now rare in Victorian recration reserves; an 1885 fence and gates, later modified (1926) to include memorial pillars to World War 1 servicemen, 1904 rotunda, 1906 ticket office, stone lined drain (1881- 1886) and a 1909 bridge. The buildings and structures are positioned in an attractive treed landscape influenced by three leading designers, Hodgkinson, Guilfoyle, and Linaker. The centrally positioned Lake Victoria (1883-5) is an significant feature of the landscape, and the planting of contrasting conifers, evergreen and deciduous trees is highly ornamental. 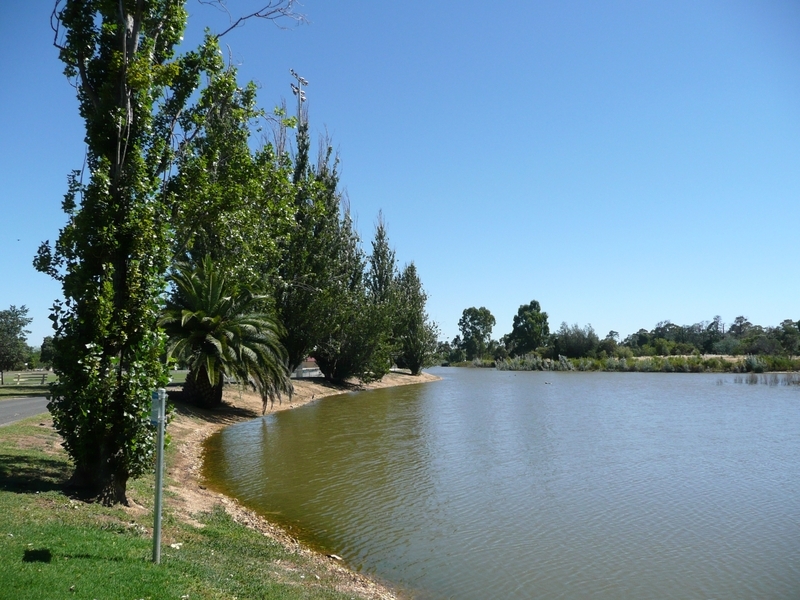 Prince's Park is one of Victoria's oldest recreation reserves and is highly valued and extensively used by the community. Since 1857 the Park has been a meeting place for sporting contests, community events and a site for passive recreation. The Highland Gathering has been held on New Years day at the Park since 1857 and is claimed to be the longest continuous event in Australia. *Painting of previously painted walls, posts, and roofing in the same colour. *Treatments to stabilise and protect timber structures. *Refurbishment of existing toilets including removal, installation or replacement of sanitary fixtures and associated piping, mirrors, wall and floor coverings. *Installation, removal or replacement of electrical wiring provided that all new wiring is fully concealed and any original light switches, pull cords, push buttons or power outlets are retained in-situ. *Installation, removal or replace of bulk insulation in the roof space. *The process of gardening, mowing, hedge clipping, bedding displays, removal of dead plants, disease and weed control, emergency and safety works and landscaping in accordance with the conservation plan. *The replanting of plant species to conserve the landscape character. *Management of trees in accordance with Australian Standard; Pruning of amenity trees AS 4373. *Removal of plants listed as Noxious Weeds in the Catchment and Land Protection Act 1994. *Repairs, conservation and maintenance to hard landscape elements asphalt and gravel paths and roadways, rock edging, fences and gates. *Installation, removal or replacement of garden watering and drainage systems beyond the canopy edge of listed trees. *Plant labelling and interpretive signage. *All maintenance works to provide for quality turf and a safe playing surface. *The erection and removal of temporary structures necessary for the staging of sports events and community functions. *The maintenance and replacement of play equipment to meet Australian Standards; Playground equipment for parks, schools and domestic use As 1924; Playgrounds - Guide to siting and to installation and maintenance of equipment AS 2155; and Playground surfacing - Specifications, requirements and test method AS 4422. *Management of the Caravan Park in accordance with the existing contract. The purpose of the permit exemptions is to allow works that do not affect the cultural heritage significance of the Park. Intrusive elements and elements of no significance may be removed or internally altered without a permit from Heritage Victoria.